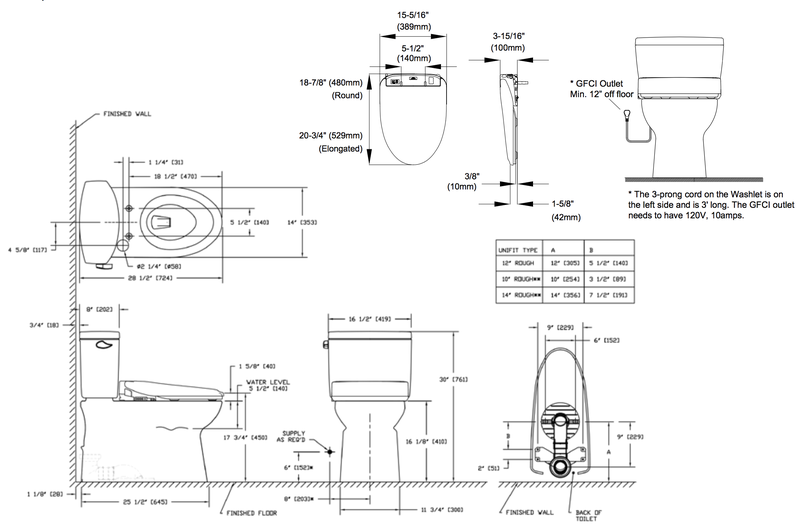 The Vespin II Washlet+ S350e Toilet and Bidet System features a sleek, contemporary look and wide array of high-end features that will transform the way you use the bathroom. The ADA compliant Vespin II toilet features a 1.28 gallon flush powered by TOTO’s forceful Tornado Flush System, and the bowl is coated with TOTO’s high-tech CeFiONtect glaze for a slick surface that deters waste residue from sticking. What’s more, the Vespin II was specially designed by TOTO to hide the cords and hoses of the S350e Washlet+ for an exceptionally streamlined silhouette. The S350e Washlet+ is packed with high-end features that will take your restroom experience from ordinary to extraordinary. The bidet’s lid automatically opens and closes whenever someone walks towards or away from the toilet, and the adjustable heated seat keeps your rear toasty no matter the temperature. Four wash modes (front, wide front, rear and soft rear) provide a cleansing solution for every situation, and the instant water heating system provides unlimited warm wash water. For maximum convenience and comfort, the seat’s water temperature, water pressure and wand position are adjustable, and the oscillating and pulsating spray options provide additional soothing and relaxation for tender areas. When your wash cycle is complete, you can dry off without relying on costly and abrasive toilet paper thanks to the S350e’s warm air dryer, and the seat’s deodorizer automatically kicks on each time you use the bathroom to stop odors from lingering. The built-in nightlight provides gentle illumination for greater safety and ease of use during nighttime restroom trips, and the energy saving mode reduces the seat’s electricity consumption when you’re not using it. Furthermore, the S350e comes with a sleek, wireless remote with two user presets that allow you to pre-program your favorite settings for a personalized wash and dry at the touch of a button. Finally, the S350e takes hygiene to new heights with its eWater+ sanitizing system, which uses electrolyzed water to mist the bowl prior to use, thereby stopping residue from sticking, and to sanitize the bidet’s nozzles after each use. With its sleek look and high-performing, luxury features, the Vespin II Washlet+ S350e Toilet and Bidet System is designed to deliver a supremely comfortable and convenient experience from start to finish.